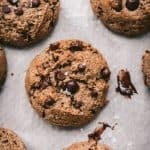 These vegan and gluten free oatmeal chocolate chip cookies are PERFECT. Extra chocolate chips and flaky salt take these tender, delicious cookies to the next level. We suggest making a double batch! In a small bowl, stir together flax meal and water and let sit to thicken for 15 minutes. Using a stand or hand mixer, blend together butter, vanilla, maple syrup, almond butter, flax eggs, coconut sugar, and cane sugar. In a separate bowl, whisk together oat flour, almond flour, cinnamon, salt, baking powder, baking soda, and xanthan gum. Slowly incorporate into wet mixture. Stir in oats and chocolate chips. Use a cookie scoop to portion dough onto parchment paper-lined sheet pan. Bake 11-12 minutes. Remove from oven and sprinkle each cookie with a bit of flaky salt. Let cool at least 10 (preferably 20) minutes to set. Note that the recipe also contains both almond butter and almond flour. If you are allergic to tree nuts, you can sub the almond butter with another nut or seed butter (peanut would be my first choice, but sunflower seed butter should also work). A substitute for almond flour is a bit trickier. We’d suggest replacing it with more oat flour, but the texture may not be quite as soft and fluffy.